Global Gasoline Gensets Market size will surpass USD 4 Billion by 2025, as reported in the latest study by Global Market Insights, Inc. 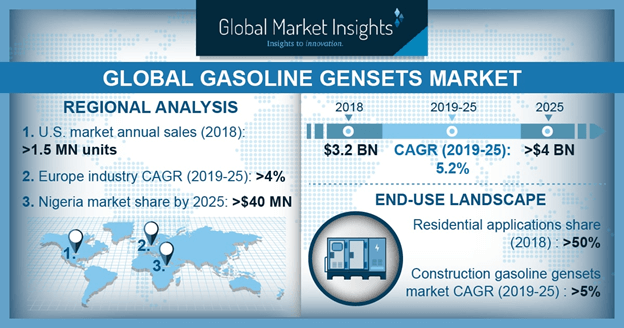 Growing demand for backup power and rising consumer awareness toward emergency preparedness measures to combat intensifying and frequent electrical outages will boost the global gasoline gensets market growth. These gensets predominantly serve the purpose of portable or intermittent backup power solutions. Affordable power, easier fuel availability, simpler operation, and high portability are some of the key features that will stimulate the product penetration in the coming years. The U.S. gasoline gensets market, in 2018 recorded an annual sales of over 1.5 million units. Increasing frequency and intensity of weather-related disasters leading to prolonged outages will boost the product adoption in the country. The industry has witnessed a dramatic upsurge in the last several years as Hurricane Sandy, Tropical Storm Irene, and other severe storms had led to extensive electrical failures. Moreover, aging grid infrastructure coupled with deteriorating grid resiliency will further complement the industry expansion. Strengthening consumer inclination toward purchasing compact units will drive the 2kVA-3.5kVA and 3.5kVA-5kVA gasoline gensets market growth. Growing preference for units with smaller surface footprint, and easier portability will sustain the dominance of smaller power rated gensets. Light weight, operational suitability, and compactness are the major features encouraging the use of these units. The construction gasoline gensets market size is predicted to grow over 5% from 2019 to 2025. The sector is poised to grow on account of sizeable investments in infrastructure development, most notably across the emerging economies. For instance, the growth in the Southeast Asia is being driven by investment across new infrastructure ventures, with subsequent expansion in construction of buildings across the residential and non-residential sectors. Residential sector, in 2018 held over 50% of the global gasoline gensets market size. These gensets are operated across households when there is a temporary disruption in the main grid or other primary supply of electrical power. Increasing severity of weather outages and intensifying load on the utility power supply along with growing consumer awareness toward backup power solutions will drive the industry growth across the sector. Three-phase gensets market size is anticipated to expand over 5% by 2025. Three-phase gensets are commonly installed across commercial environments and industrial power applications. Invariable power supply, high flexibility, and appreciable material efficiency are some of the distinguishing features supporting the product adoption. Nigeria gasoline gensets market size is set to exceed USD 40 million by 2025. The inadequacy of utility grids to cater to the burgeoning population has firmly gripped the country, thereby entailing the extensive usage of these gensets. In addition, high electricity prices, poor transmission & distribution networks, and rapid population growth are driving a strong demand for these units in the country. Eminent industry participants across the gasoline gensets market comprise Briggs & Stratton, Caterpillar, Generac, Kirloskar, Cummins, Atlas Copco, Kohler, Honda, Yamaha Motor, Wacker Neuson, Firman Power Equipment, John Deere amongst others.